“StreetARToronto (StART) was launched in 2012 as an innovative, public-private partnership program designed to develop, support, promote and increase awareness of street art and its role in adding beauty and character to Toronto neighbourhoods. Artwork by Gary Taxali. Photo: City of Toronto. 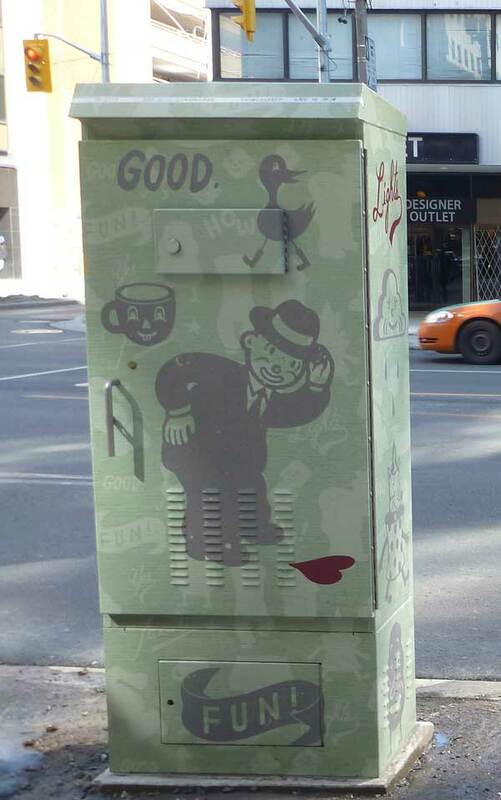 The City of Toronto invites local area artists to submit proposals to create art on City traffic signal boxes at various locations throughout Toronto. The goal of this Outside the Box project is to provide opportunities for artists to create works of art that contribute to the vitality and attractiveness of the streetscape. This project is being implemented by StreetARToronto (StART), part of the City of Toronto’s Transportation Services Division. This year 30 Traffic Signal Cabinets will be transformed. Please click here for more info on Outside the Box project and the application process. 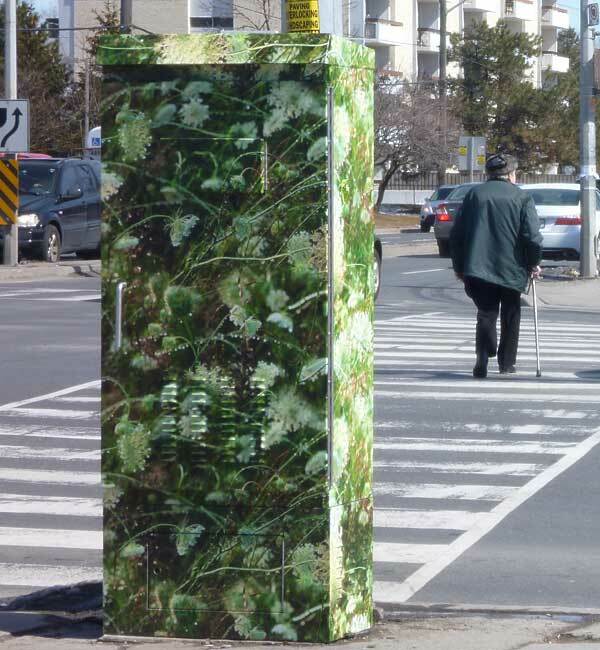 The City of Toronto’s Outside the Box program, a collaboration between Transportation Services’ Public Realm Unit and local artists, is wrapping traffic cabinet boxes with a graphically attractive, synthetic wrap. The project, which features original artwork by Gary Taxali and photographic images by the late Moira McElhinney, is designed to beautify city infrastructure while reducing graffiti vandalism. The more than 2,200 traffic-signal boxes across the city contain equipment that controls the traffic signals. The boxes are often susceptible to postering and graffiti vandalism. Taxali, a Toronto visual artist whose work has appeared in publications such as the New York Times, Esquire and Rolling Stone, serves on Canada Post’s Stamp Advisory Committee. In 2012, the Royal Canadian Mint released a special edition of six Gary Taxali 25-cent coins. McElhinney was a Toronto photographer who produced work that focused predominantly on nature and panoramic landscapes. Many jurisdictions and companies worldwide have taken a pro-active approach to engage artists to paint or design protective wraps to beautify the streetscape and reduce the cost of cleanup and maintenance. Outside the Box is a creative way to help the City reduce the impact of graffiti vandalism while at the same time support local artists and contribute to the vitality and attractiveness of the streetscape. Next Next post: Canada’s Earth Hour Campaign & Candle Safety Tips: March 29, 2014 at 8:30 P.M.